Whether probiotics are helpful for SIBO is arguably the most debated subject in the SIBO world. Some practitioners say probiotics just add fuel to the fire while others say that probiotics are crucial to restoring balance in the GI tract and preventing SIBO relapse. This constant argument between the pro-probiotic camp and anti-probiotic camp made my head spin during my own SIBO journey. Initially, I remember being terrified of probiotics. I was not going to add fuel to the fire. But, as time passed, I also realized that my large intestine dysbiosis was also fueling my SIBO fire. I was torn! I decided to deep dive into the research on probiotic use for SIBO treatment. This research inspired me to write my very first blog post! After digging through the research, I was comforted that all of the studies I looked at showed positive benefits of probiotics for SIBO (both as a stand alone treatment and in combination with antibiotics). I concluded that small intestine function can not be examined in isolation of the large intestine environment. If you have pathogens or overgrowths downstream, your Migrating Motor Complex activity may be suppressed creating an environment for SIBO to develop. Therefore, probiotics (theoretically) can help to restore balance in the GI tract and re-establish healthy MMC function. Please check out my original probiotics post to learn more. Since I published that article, new SIBO/probiotic research has been released that has provided some new insights. I wanted to circle back to cover this new data and to touch on key insights on probiotics for SIBO. How do probiotics help you achieve healthy balance of bacteria in your gut? Probiotics help establish a healthy balance through three main mechanisms. First, probiotics have been shown to play a powerful role in modulating the guts immune system. There is a high prevalence of SIBO in individuals that have immune-compromised conditions making the immune modulating effects of probiotics valuable in treatment. Second, probiotics produce anti-microbial compounds that can help eliminate pathogens. These antibiotic compounds can attack the overgrowth in the small intestine head on. Probiotics also produce enzymes that contribute to the production of short chain fatty acids that reduce the pH in the colon creating an unfriendly environment for pathogenic bacteria. Third, probiotics strengthen the gut barrier function and inhibit adherence of pathogenic bacteria to the walls of the GI tract. Are probiotics helpful for SIBO? More importantly, are probiotics right for you, right now? The biggest issue I have with the probiotic debate is that it is often presented as a black and white issue. Probiotics are either touted as helpful for SIBO or harmful. To me, this black and white way of thinking about probiotics is unfortunate. Each case of SIBO is different. Making a blanket assumption that probiotics are good or bad can prevent people from adequately analyzing the more important question: are probiotics right for you? Probiotics are not inherently good or bad for SIBO. Probiotics are a tool. Sometimes probiotics are right for you and sometimes they are not. There are two big questions that need to be sorted out on a case by case basis. First, what are the right strains? Second, when is the right time to take probiotics? What are generally the right probiotic strains for SIBO sufferers? Probiotic supplements are not all created equal. Every probiotic supplement or food is going to have different strains and CFUs. You cannot lump all probiotics together. Just because one probiotic didn’t work for you doesn’t mean all probiotics won’t work. The strains may not have been the right fit for you. I have tried probiotics that haven’t agreed with me and others that I have found helpful. Many of my SIBO clients tell me that they felt horrible when they were on probiotics. In most these clients, they took a probiotic that contained strains that produce lots of D-lactate. D-lactate is a byproduct of certain bacteria, especially many Lactobacillus strains that are found in most probiotic supplements. SIBO sufferers can often have overgrowths consisting of D-lactate producing strains leading to elevated levels of D-lactate production locally in the GI tract and in the blood. D-lactic acidosis is a result of D-lactate building up in the blood and is associated with neurological symptoms such as altered mental status, slurred speech, confusion, disorientation, difficulty concentrating, memory deficits, excessive sleepiness, weakness, abnormal gait and problems with muscle coordination. Symptoms are often similar to being drunk. This acidosis has been associated with Short Bowel Syndrome and has recently been linked to SIBO. There was a recent study that blew up in the SIBO community and many used it to support broad sweeping notions that probiotics are not good for SIBO treatment. The study was looking to establish a link between brain fogginess with SIBO and D lactic acidosis. There was a higher prevalence of brain fogginess and D-lactic acidosis in probiotic users that had SIBO than study participants that didn’t have SIBO. While this study had a lot of short comings, it did jive with the anecdotal reports of poor tolerance in my SIBO clients who took probiotics with d-lactate producing strains. Steering clear of d-lactate producers can raise the probability of probiotic tolerance. Many people also react to lactic acid producing strains because they can increase your histamine load. Histamine is a compound that is a key player in our immune response when levels are optimal. But, if histamine levels become too high, you can develop an exaggerated immune response that leads to symptoms like headaches, runny nose, hives, brain fog, itchiness, flushing and more. SIBO can already create higher levels of histamine for three main reasons. First, your overgrowth may be comprised of histamine producing bacteria. Second, inflammation in the GI tract will cause an increased immune response and more histamine to be released. Third, damage to the GI lining can inhibit DAO enzymes that are responsible for breaking down histamine. With the potential for an already high histamine load due to the SIBO, histamine producing probiotics can really add some unnecessary fuel to the histamine fire. I attribute most of the negative reactions to probiotics to taking the wrong strains of bacteria. Usually my clients do much better with Soil Based Probiotics or D-lactate/histamine free probiotics. When is the right time to take probiotics? Timing is the second important factor when figuring out whether you should take a probiotic. Choosing the right time to take a probiotic can be a key factor to probiotic tolerance. For instance, if you have yet to address some of the root causal factors that are causing your SIBO, you may not tolerate probiotics quite yet. Cases with more severe MMC deficiency could struggle with poor probiotic tolerance because the probiotics will not be efficiently moved through the GI tract. Also, some don’t tolerate probiotics while the bacteria levels are high in the small intestines. Waiting to introduce probiotics until after the overgrowth is reduced or cleared can also help increase tolerance to probiotics. While probiotics can be helpful, they will not solve imbalances on their own! Probiotics can help rebuild and rebalance your GI tract, but they should not be the sole tool. I remember falsely thinking that all I had to do was take these probiotics to get my gut rebalanced after antibiotics. It was hard to kick the quick fix mentality when I grew up being told that there was a pill to fix every problem. 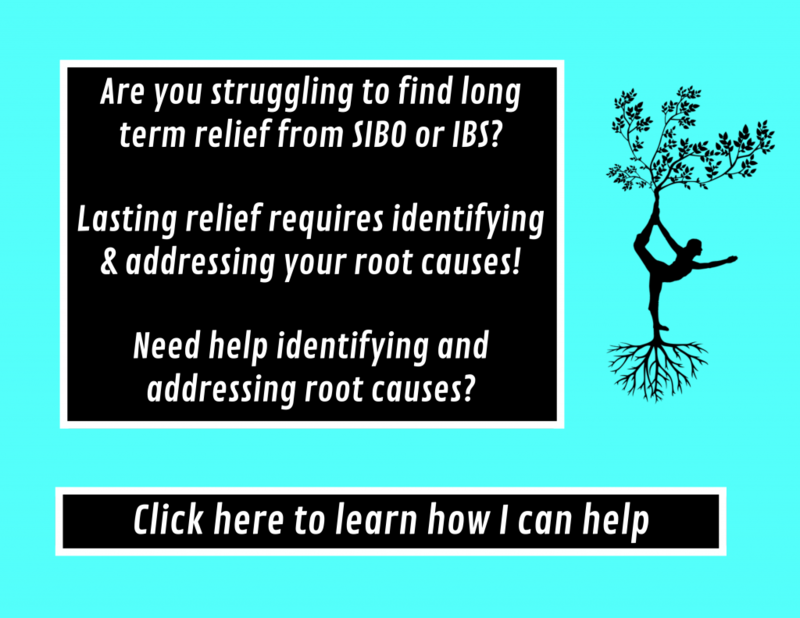 I see many people in the SIBO community relying on supplements to fix there GI problems and failing to address key lifestyle problems like stress management, sleep, diet, physical activity and relationships. Probiotics will go in and create an optimal environment for good bacteria to grow and pathogens to die. You can think of probiotics as providing good soil! Just because there is good soil, doesn’t necessarily mean that a plant will grow. Plants need sunlight, water and protection to grow. Just taking a probiotic will not lead to long term positive shifts in your microbiome without the addressing other areas necessary for gut bugs to thrive. Probiotics provide rich soil, but the gut bugs need food to grow. Most SIBO diets lack the fuel (prebiotic fermentable fibers) needed for good gut bugs to grow. Fermentable fibers are crucial to recovering balance in the GI tract. Low fermentable fiber diets such as the LOW FODMAP diet are problematic when done for more than 6 weeks, because you are starving your good gut bacteria. As I mentioned in my prebiotics article, most of the studies on supplemental prebiotics for SIBO and IBS have shown positive results. Prebiotic supplementation has been shown to raise levels of Bifidobacterium, which improve MMC function in mice. When implemented properly, dietary prebiotics and even supplemental prebiotics can be helpful for most people with SIBO. Stress can cause negative shifts in gut bacteria. It is crucial that stress management is addressed during treatment. The stress of a very restrictive diet can be counterproductive for gut health, because it can actually cause detrimental shifts in gut bacteria! The right type and amount of physical activity can also help balance the microbiome. As I discuss in this post, physical activity can increase bile output, which helps regulate the growth of bacteria in the small intestines. Exercise has also been shown to drive positive shifts in gut bacteria and increases in diversity. Sleep and good circadian rhythms also effect bacterial composition in the gut. It is crucial you are getting at least 7 hours of sleep every night (more optimally 8 hours) to have a healthy microbiome! What are some helpful probiotic brands that I recommend? Sometimes if one is not being tolerated well, I will usually either lower the dose or I might switch to another one on this list. I may also decide to stop probiotics for a period and add them back in later. It can take some experimenting to see what works! Probiotics can be a helpful tool in SIBO treatment to help restore balance in the GI tract. You just need to determine what strains are right for you and when to add them in. Need help rebuilding your microbiome? Contact me to set up a free 20 minute consult with me to learn how I can help! Previous Previous post: Why physical activity is crucial to beating SIBO?